If you are looking for a great gift idea, look no further than Apples of Gold's Heart Shaped pendant in fine sterling silver. 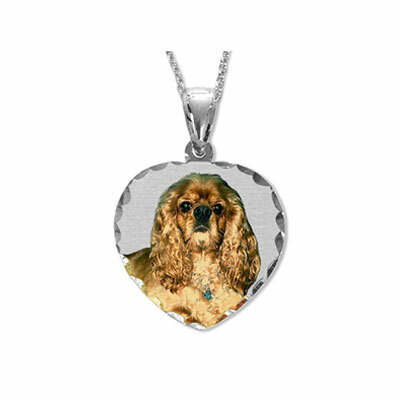 Featuring beautiful color photo pendant, this necklace is perfect for formal, business, or casual wear. Coming in at just under one inch by one inch this charming pendant is bright enough to draw attention but small enough to not overpower any style you may be looking to achieve. The Heart Shaped Color Photo Necklace Pendant is a great addition to any jewelry collection and is a common gift for birthdays, anniversaries, Mothers Days or any occasion that requires something special. Wear it every day and let people know what is most important to you in life with this stunningly beautiful pendant and necklace set. We guarantee our Heart Shaped Color Photo Necklace Pendant in Sterling Silver to be high quality, authentic jewelry, as described above.